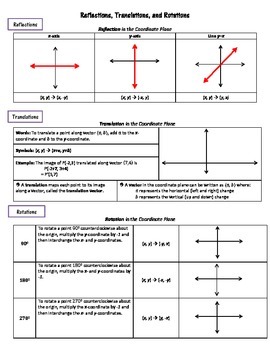 This FREE "Transformations_Summary" sheet sums up my entire PowerPoint [called "Transformations (rotations, translations, and reflections)...only $4!!!!! ] and serves as a quick reference for students. **Also provided for FREE is a half-sheet of paper that corresponds with each example presented in the PowerPoint presentation about Transformations (rotations, translations, and reflections). Include examples of each topic that students can do during your presentation.